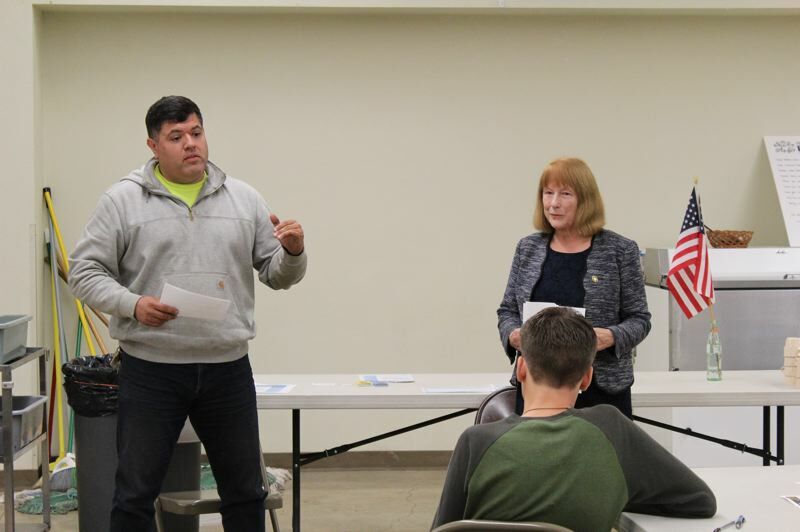 Susan McLain and David Molina made their cases for the Nov. 6 election in Verboort. The candidate forum portion of Community Participation Organization 13's meeting Wednesday, Sept. 12, in Verboort was short — less than an hour in length — and it was explicitly not structured as a debate. But the differences between the two candidates for House District 29 were starkly apparent nonetheless. Some of them were obvious right away, albeit superficial. Democratic Rep. Susan McLain was formally dressed for the event in a dark-colored dress, sweater and heels. David Molina, her Republican challenger, wore a plain gray hooded sweatshirt over a T-shirt, jeans, and work boots. McLain, a former speech and debate teacher who was first elected by voters in the Forest Grove-, Cornelius and west Hillsboro-area district in 2014, spoke in a measured, even relaxed, voice throughout the forum. She often took a few seconds longer than the 90-second limit for answers to conclude a point, and she remained on her feet even during her opponent's speaking time. "I have to tell you, sitting down as a speech teacher is absolutely — I have two (former) students sitting back there, and if I sit down, all of the rules that I taught them…" McLain quipped, letting the thought remain unfinished. Molina usually availed himself of the folding chair provided for him when it was not his turn to speak, sitting and listening to his opponent. When he spoke, Molina's tone was forceful, impassioned and sometimes accusatory. He spoke quickly, stumbling over his words on occasion, while arguing for why HD 29 and the state government of Oregon need change. "I'm just irate, and I cannot stand it that there's not been enough action in Salem," said Molina in summarizing his positions. The two candidates, who face off on the Nov. 6 ballot, each fielded six questions from moderator Chas Hundley, CPO 13's president, plus one more from the audience. Questions generally focused on McLain and Molina's contrasting views of what kind of job the Oregon Legislature, which has been wholly controlled by Democrats since 2013, is doing, as well as their perspectives on what the role of the Legislature on various issues should be. Answering a question of whether the candidates believe small businesses in Oregon are taxed fairly, Molina blamed "regulations and taxes coming out of Salem" for harming the ability of startups to prosper. "It breaks my heart when I see businesses start, and then they fail after three, four years," Molina said. "And the number-one reason why they fail after three, four years, or they don't ever get off the ground, is because of the overburdened regulations that's coming out of Salem. We don't have our representative from District 29 standing up for small businesses on the needs that they face strongly enough." Molina argued that the state should treat small and large businesses "completely different." "We're treating small businesses … like we treat Nike," said Molina, a self-taught software developer who founded a nonprofit called Operation Code to promote vocational training in the field for veterans like himself. He added, "They don't have lawyers. They don't have accountants. … I don't have lawyers on my staff." In her response, McLain brought up her own small business bona fides — her late husband owned a machine shop in Cornelius, she said — and said she has worked to support small businesses during her time in the Legislature. "I heard at every dinner table exactly how government and the state should do a better job in different ways," McLain said, "and so when I went down to Salem, one of the things that I wanted to do was to make sure that my husband would be proud of the work that I did in small business areas." She added, "We have to make sure that we're helping all businesses — are their taxes fair? Tax reform is what we're trying for. It's not easy, but in the last three years, we've worked through the revenue committee of setting up three or four studies, as well as going out and talking to big, small and medium businesses about what are the things that will help them succeed and prosper." Perhaps the broadest gulf between the candidates was on the question of Oregon's PERS, or Public Employees Retirement System, which provides pensions for retired and medically disabled individuals who worked for the state and local government or public school districts. McLain worked as a public schoolteacher, mostly in the Hillsboro School District, before retiring in 2014. As such, she receives a monthly PERS pension of $2,231 per month, according to state data obtained and published by The Oregonian/OregonLive. McLain noted that the Legislature had been working for years prior to her arrival in Salem on PERS reform, in an effort to pay down the system's unfunded liability that has swollen to more than $25 billion. "The Supreme Court of Oregon had disagreed with the changes the Legislature made, because they said if they earned their salary or their package, whether it be retirement or insurance, you can't take it away when they've already done the work," said McLain, referring to a unanimous court ruling in 2015 that effectively invalidated most of a package of PERS reforms passed two years earlier. "And so the big way to actually change the PERS system, which was to somehow stop paying folks for works that they had already done, they said, 'You can't do that.' The only thing that you can do is work forward to change the system that's there." Molina argued that certain PERS recipients ought to be "cashed out" so the state doesn't have to keep providing them regular pensions, although he admitted that he is not sure whether his ideas for PERS reform are legal. He also suggested that state officeholders who receive PERS benefits are compromised when it comes to addressing the issue. "I eat what I kill. And I'm not on free PERS. And I don't have a conflict of interest in this fight," Molina said. "I think when choosing your state representative, you've got to look for someone that doesn't have a conflict of interest." He added, "To kill the conflict of interest, I think we need legislation, and we need to ensure that the governor, legislators and the Supreme Court definitively — who's been a roadblock on this — does not have PERS. That way, you don't have a dog in the fight." Part of Molina's platform is that there should be restrictions on how long an elected official can serve. "We … need to ensure that we install term limits so that we don't have somebody in office 30-some, 33 years," Molina said. McLain, who served as a Metro councilor from 1991 to 2006 before her more recent four-year stint in the Oregon House of Representatives, disagreed. "You guys do have a chance to have term limits — you get to vote," McLain told the audience. "And if you don't think I'm doing a good job, then you know that you've got somebody else you can vote for." 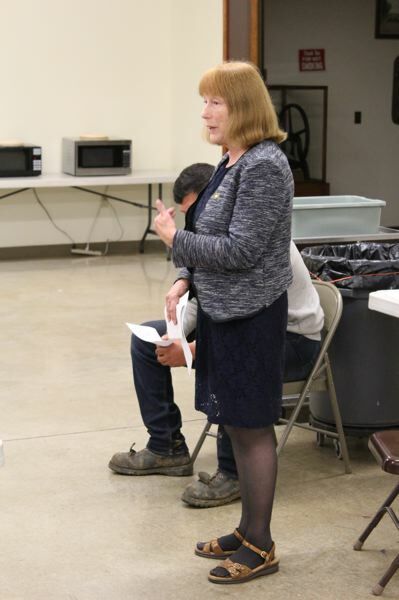 Along with McLain and Molina, Rep. Janeen Sollman of House District 30 and her challenger, Dorothy Merritt, were also invited to the forum at the Visitation Parish Center in Verboort. Merritt declined to attend — she told this newspaper she had "other commitments" — while Sollman only spoke for a few minutes before leaving early. CPO 13 represents the Verboort, Gales Creek and Roy areas, which are unincorporated. Sollman, who now lives in Hillsboro, said that she grew up in Gales Creek. CPOs serve as both advisory bodies to the Washington County government and regular public forums where community members can meet, discuss issues and hear from local officials. Representatives from both the Washington County Sheriff's Office and Forest Grove Fire & Rescue also spoke and answered questions from attendees at Wednesday's meeting in Verboort.